Amazon Prime Music is coming to India soon, it will be Free for all the Amazon Prime members. As an Echo dot user, am getting Music from the Amazon Prime music. 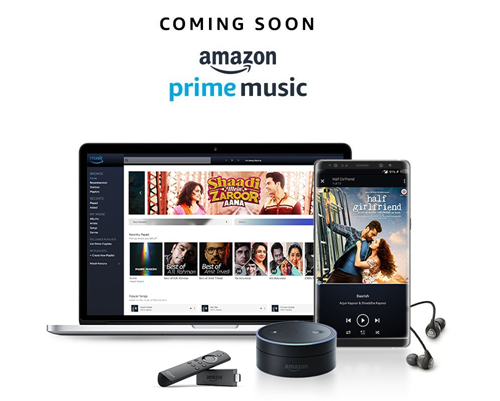 Echo users is getting a preview of Amazon Prime Music, not getting the Amazon Prime Music Application in India as of now. Amazon prime music allow you to listen to songs of different languages (English and many other Indian languages) with out any advertisements. It also support offline listening. Amazon Prime Music allows you to create playlists which you can easily used with the your devices such as mobiles and/or new Echo devices. Prime members will soon get to enjoy unlimited ad-free music streaming across millions of songs in English and multiple Indian languages across multiple devices. All this will be included with your Prime membership at no additional cost. Amazon India recently launched Amazon Echo a device powered with a voice assistant Alexa by Amazon. You will need an invitation to buy one which you can get from the Amazon India online store itself. As an introductory offer you will get 30% off , One year Prime membership (INR 999 now, which was INR 499 earlier, We covered it here). If you are using Amazon Pay balance you can get an additional 15% off. As a Prime Member you will get Free shipping, Amazon Prime Video access, additional discounts. Amazon Prime Reading offers Free to read and Free Kindle Book every month.